Being a physical runner is about more than just absorbing hits and breaking tackles. It’s a mindset. You have to want it. You have to be willing to bait defenders into contact just to give it back twice as hard. When a player slides laterally out of tackles instead of using proper leg drive, it tells me they lack that killer instinct. Questionable killer instinct aside, Jeremy Langford has reportedly put on 8-10 pounds in anticipation of an increased role this year in Chicago. This is a positive sign, indicating he is ready to show more of a commitment between the tackles. But Langford’s problems only begin at breaking tackles and making people miss. John Fox's Lead Back or Merely a Committee Member? Before we get into Langford’s pathetic efficiency numbers from 2015, we should also acknowledge that his three-game fantasy explosion as the lead back was largely touchdown-dependent. Don’t be fooled, Langford was still not breaking tackles and was plenty inefficient during this span with Matt Forte out as well. Langford scored seven total touchdowns in his rookie season, four from the 1-yard line, two from inside the 6-yard line, and one was a long 83-yard reception where he was untouched. His 100% touchdown success rate from the 1-yard line last season is impressive as the league average is 53%, but it’s completely reasonable to believe this proficiency is likely to regress in 2016. In general, from a DFS or week-to-week perspective, we hear a lot of talk about volume and opportunity being crucial in our decision making process. This is correct, if we can accurately predict significant volume, talent is not our first priority in the short term for fantasy purposes. In season-long and dynasty leagues, efficiency is very relevant. It’s how players maintain jobs throughout an entire season or extended period. You have to be on the field to get fantasy points and don’t kid yourself, like draft capital, talent and ability does matter. 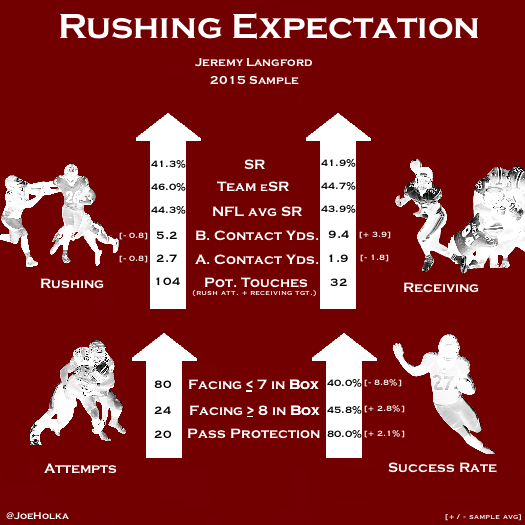 We know that Langford dropped a ton of passes last year and broke a historically low amount of tackles. Throw in his lack of efficiency and on one hand it would be reasonable to believe that he is on a short leash entering 2016. With that said, Matt Forte appeared in 13 games last season and Langford still finished as the RB24 in standard leagues. That should mean something. Right? Dowell Loggains has been promoted from the Bears quarterback coach to offensive coordinator, replacing Adam Gase. I still expect the system to be largely similar to last year, where Chicago will lean heavily on shortening games and limiting mistakes. The common narrative surrounding head coach John Fox is that he prefers the running back by committee approach. Contrary to what we have seen in the past, I am not convinced Fox “prefers” to split his backfield. It’s possible this fact is being misinterpreted in the fantasy community in my opinion. It is very possible draft capital could have played the largest role. 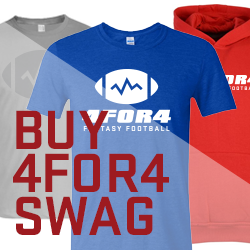 For example, both DeAngelo Williams (27th overall) and Jonathan Stewart (13th overall) were both first round picks. Montee Ball (2nd-round pick) and Ronnie Hillman (3rd-round pick) were used even with the much more talented C.J. Anderson (UDFA) in the backfield. The Bears had a 20-touch back 56% of the time last year but Langford averaged 21.3 touches per game when Forte was out. Fox showed a comfort level of riding Langford, who played 74% of the offensive snaps in those three games. Langford ran the top forty time (4.42) at the combine just a year ago, and his long speed is above average. However, his change of direction is adequate at best, and he is not dynamic in his ability to make defenders miss. Langford's run distribution is not abnormal, as the majority of his runs went through the middle. He ran least frequently to the outside. 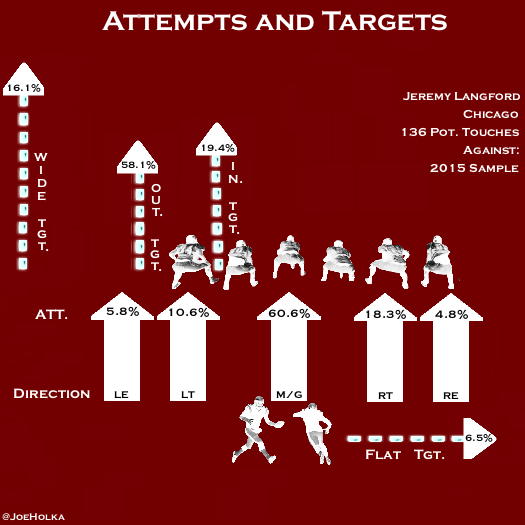 Pre-draft, most people thought of Langford’s ability in the passing game as a strength (converted wide receiver), but he struggled with drops all season. I still believe Langford has adequate ability in the passing game, and his 32 targets in this sample represented 23.5% of his potential touches (rush attempts + targets), which is slightly above my 20-player sample's collective average. Langford's target distribution was heavily skewed towards targets to the outside (58.1%). Surprisingly, Forte’s 44 receptions in 2015 was only the second time a player has topped 34 catches in a Fox backfield. Expected Success Rate (eSR) is the signature metric of Rushing Expectation and highlights the fact that not every Success Rate (SR) is created equal. Offensive lines have a direct correlation with running back success, and how far a player falls below or exceeds expectation is extremely relevant. If you are new to this series, you can learn more about this metric in my introduction video or article found here. While offensive lines show a direct correlation to running back success, a running back's skill still plays a part. Lets look and see how Langford performed in comparison to what was expected behind this Bears offensive line. Contrary to popular belief, Langford was not a big play threat last year. He had just two runs over fifteen yards over the entire season. The overall eSR for Langford and the Bears was 46.0% per rushing attempt -- seventh-best in the NFL and above the NFL average of 44.3%. Offensive line play clearly wasn’t Langford's issue. Chicago was actually less impressive in pass protection at 44.7% expectation, hovering right around the league average eSR (43.9%). Per attempt, Langford was most successful behind the right end with a SR of 60.0%, though it was only 4.8% of his total rushing sample size. Langford performed slightly above his team expectation through the middle, his largest sample size (47.6%). His power is solid, but he lacks aggressiveness between the tackles. He is far too reliant on spin moves instead of getting downhill. Per target, Langford saw the most volume to the outside, but was most efficient in the flat and wide areas of the field. His biggest play all season, an 83-yard receiving touchdown against the Rams, came to the inside, however, and accounted for 15.3 of his total 17.5 points originating from that area. Ameer Abdullah, David Johnson, and Latavius Murray also finished with a 100.0% SR in the flat, but of that group Abdullah (23.5%) was the only one who had more than 9.5% of his total targets go to that area of the field. It’s becoming more and more clear that efficiency concerns with Langford in the community are valid. Let’s check out his overall Rushing Expectation results and gather more clues as to what went wrong. Behind what was statistically the seventh best run blocking offensive line according to Adjusted Line Yards, Langford performed below expectation in his 2015 sample by -4.7% in the run game, and was below sample average in expected pass game efficiency by -2.8%. Murray’s lack of rushing efficiency put him second to last in my entire 20-player sample in regards to percent above/below expectation, trailing just Latavius Murray (-6.9%). Elusiveness behind the line of scrimmage is an extremely underrated -- but prevalent -- ability among the league's best feature backs. Langford’s 5.2 yards before contact figure was well below sample average, in front of only Melvin Gordon (4.8). Langford’s elusiveness was poor and he lacks the ability to make quick and deliberate cuts in comparison to other backs in my sample. His athletic ability is adequate, but he shows below average agility behind his offensive line. His before contact yards number in the passing game is largely inflated by the 83-yard touchdown I mentioned earlier, where he was untouched. Langford has average mental processing skills and solid instincts. For a back with above average long speed, he does little to take advantage of it in at the second level. We’ve touched on it quite a bit already, but Langford was one of the worst running backs in the league in yards after contact. His 2.7 yards per attempt after contact finished dead last of my initial 20-player sample, and he rarely accelerates through contact like you would like to see. I should clarify that I chart yards after contact directly after a player is touched, this includes hands and arm tackle attempts. I felt it was the best way to keep this consistent in my study so my numbers may vary from other methods. Langford shows poor balance through contact and lacks finishing ability in comparison to nearly every running back in the NFL. I charted an above average 76.9% rush attempts against seven or less in the box for Langford. On those carries, he produced a putrid 40.0% SR, second-worst in my sample to Murray (36.0%). Langford finished 2.8% above the sample average against eight or more in the box, but has average ability to find lanes overall and is average at best from an improvisational standpoint. One of the biggest things holding Langford back from ever being a long-term feature back is his deficiencies as a blocker, though he has shown improvement so far in the preseason. He is capable with his hands when motivated, but is below average in his footwork when attempting to use angles to his advantage. This is not exactly a groundbreaking assessment, but from a talent perspective, I can’t justify grading Langford as any more than a committee-caliber back. On the surface, you look at his opportunity in Chicago and you would think he deserves at least your consideration as more than that in 2016. Langford was the clear first-team back in the first preseason game despite offseason reports of a committee being locked in. Despite his struggles last year he was still given two targets per game even with Forte playing 13 games. It would be wrong to not acknowledge that there is at least the “chance” he could get a real shot as the workhorse for the Bears this year. Another positive is that with Forte out of the picture, Langford’s competition is comprised of rookie Jordan Howard and holdovers Ka’Deem Carey and Jacquizz Rodgers. All three lack high-end draft pedigree (and skill?). Howard is a big, straight-line bruiser who is not a threat in the passing game, but could in theory take some early down and goal line work. Keep in mind we have already highlighted the fact that Langford was very effective at the goal line last season, so it isn’t apparent the Bears need an upgrade in this role. Carey has underwhelmed in his young career, and it is worth noting that he was drafted by the previous Chicago regime. Rodgers is an undersized pass-catching specialist that is not a threat between the tackles. Ultimately, we have been wrong in the past to completely write off rookies for an inefficient first season. 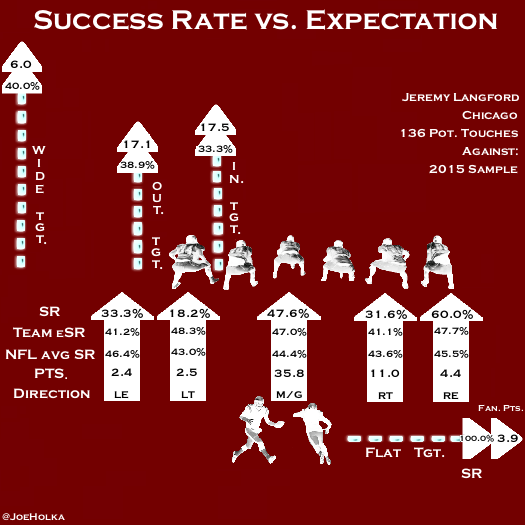 Even though using a small sample size to predict future trends is not always the best route, I do not believe Langford is due to break out in year two. At his current ADP in the fifth round around guys like Dion Lewis and Ryan Mathews he is a complete fade for me in 2016. Even if he falls a few rounds I think I would much rather hedge my bet on talent at that point of the draft. It could come back to bite me, but predicting a high volume for an entire season in August, from a player I just don’t believe in, is a situation I would rather avoid. Week-to-week, Langford could most definitely have value, but in season-long his range of outcomes is far too large for my liking.